A songbird stays perched by your side to eliminate the daily, blurry-eyed search for your frames. Birds in fairytales have long been magical little helpers, delivering letters or holding talismans in their beak. Now you can have your very own enchanting companion to hold your glasses when you're not wearing them. 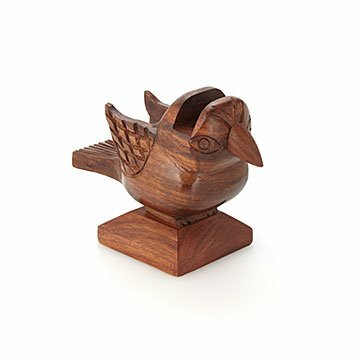 Using a single piece of sheesham wood, Fair Trade artisans in India hand carve the richly finished songbird, making him a charming piece of decor on his own or when clad in your signature specs. Keep him as your own sweet sidekick, or send to a friend to help eliminate the daily, blurry-eyed search for frames. Handmade in India. Perfect and practical decoration! My daughter picked this as a gift for her grandfather, who keeps misplacing his glasses. Goes with owl eyeglass holder I've recently purchased. My boyfriend's mom is obsessed with birds and has trinkets and bird feeders all around (and outside) the house. She's always losing her glasses too, to the point where she has one pair of readers in every room. This will be the perfect gift for her for Christmas. Thank you!